“Dammit bubba, I tell ya, these thangs sure are cute.” Gus Grissom and Deke Slayton take some time out to become buddies with a chipmunk, early 1960s. I got this from the great Insert Space Here Tumblr. We vintage picture freaks at This Space Available highly recommend this awesome archive. 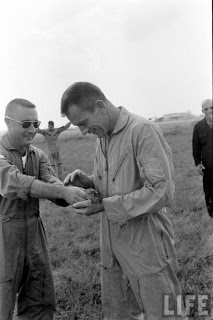 Gus and Deke were best friends in the astronaut corps, and when Gus lost his life in the Apollo 1 fire Deke was extremely distraught for a long time afterwards (well, obviously…). I love this picture of these two badasses cuddling up to this tiny, sweet animal. I wish these guys were still around to reminisce about their days as the baddest men in the astronaut corps. That would have been one heck of a collaborative book. Picture courtesy of Life Magazine and Insert Space Here. Next story I am gonna do something like a road trip 🙂 These guys were awesome!